Mockito- a great mock framework for Java development. Mockito is a mocking framework that tastes really good. It lets you write beautiful tests with clean & simple API. This artical will show some basic concepts of mocking framework, why we should use it and walkthrough a simple that applied Mockito in Java. Outside of the world of software development, the term “mock” means to imitate or to mimic. A “mock” can therefore be thought of as a stand-in, an imposter or as most commonly referred to as it pertains to softwaredevelopment, a fake. Fakes are often used as stand-ins for dependencies of the class under test. Dependency – A dependency is when one class in an application depends upon another in order to perform its intended function. Dependencies are often stored in instance variables inside of the dependent class. Class Under Test – When writing unit tests, the term “unit” generally refers to a single class and specifically the class against which the tests are written. The class under test is therefore the application class that is being tested. When we learn to program, our objects are usually self contained. Any hello world has no dependencies on outside classes (System.out aside) and neither do many of the other classes we write in the process of learning a language. However, in the real world, software has dependencies. We have action classes that depend on services and services that depend on data access objects (DAOs) and the list goes on. I know the above example is about as simple as you get, but it illustrates the point. If you wanted to test the method count, you would write at test that addressed how the count method works. You aren't trying to test that ArrayList works because you assume that it has been tested and works as designed. Your only goal is to test your use of ArrayList. The concept behind mock objects is that we want to create an object that will take the place of the real object. This mock object will expect a certain method to be called with certain parameters and when that happens, it will return an expected result. What are the key mocking concepts? When it comes to mocking, there are only 3 things you really need to worry about; stubbing, setting expectations and verifying. Some unit test scenarios don’t involve any of these, others involve only stubbing and others involve setting expectations and verifying. Stubbing is the process of telling your fake how to behave when it is interacted with. You can generally stub public properties (those with getters and/or setters) and public functions. When it comes to stubbing functions, you have a lot of choices typically. You may wish to return a specific value, throw an error or dispatch an event. Further, you may wish to indicate that the function behave differently depending upon how it is invoked (i.e. by matching the types or values of the parameters passed to the function). If this sounds like a lot of work, it can be, but it generally isn’t. One great feature of many of the mocking frameworks is that you need not stub void functions. Nor do you have to stub any functions that are not invoked or properties that are not consulted during the execution of your tests. One of the key features of a fake is the ability to tell the fake what you expect when your test runs. For example, you may expect that a specific function be invoked exactly 3 times. You may expect that it never be invoked. You may expect that it be invoked at least twice, but not more than 5 times. You may expect that it be invoked with specific types of arguments or specific values or any combination of the above. The possibilities are endless. Setting expectations is the process of telling your fake what you expect to happen to it. Remember that since it’s a fake, nothing actually happens. But, your class under test is none the wiser. From its perspective, it invoked the function and expects that it did whatever it was supposed to do. For what it’s worth, most mocking frameworks let you create mocks of interfaces or public classes. You are not limited to having to mock only interfaces. Setting expectations and verification go hand in hand. Setting expectations is done prior to invoking the function(s) on the class under test. Verification is done after. So, first you set expectations, then you verify that your expectations were met. From a unit testing perspective, if your expectations were not met, the unit test fails. For example, if you set the expectation that the ILoginService.login function should be invoked exactly once with a specific username and password, but it was never invoked during the execution of your test, then the fake would not verify and the test should fail. This one is one of the stronger benefits. If you create a Mock you can write Service Tests before the service is created, giving you the ability to add the tests to your automation environment in the development process. In other words, Service Mocking gives you the ability to use Test Driven Development. This is similar to the above; create tests for code that does not exist. But the previous point was for the developer who writes tests, this one is for the Testing Team. How does the team start creating tests when you don’t have anything to test? Mock it and write tests against the Mock! This means it’s actually possible for the QA Team to have a full suite of tests ready when a service is ready to be tested; we don’t have downtimes when one team waits for the other to finish. This makes the financial argument for mocking particularly strong. You can create proof of concepts or demos. Since Mocks can (done levelheadedly) be very cost efficient to make, Mocks can be used to create a proof of concept, as a wireframe, or as a demo for something you’re considering building. This is very powerful and gives a good ground for making decisions about both whether to go ahead with a development project or not, but most importantly for actual design decisions. This is one of those benefits that doesn’t fall into the actual benefits category, but rather works as a life saver. Ever wanted to test or use a service, only to get told that the service is behind a firewall and that that firewall can’t be opened for you or that you’re an authorized to use it? When you do, a MockService placed in an accessible place, including on your local computer, is a life saver. There are cases where there are reasons why you can’t allow access to your test systems for external sources, like partners or customers. These reasons can be access security, sensitivity of information, or just the fact that the test environment might not be accessible 24/7. In these cases; how do you provide a test system for your partner or customer to start development or test against? An easy solution is to provide a mock, either from your network or from your customers own network. A soapUI mock is extremely easy to deploy, it can either run in soapUI or exported as a .WAR file and placed in your java server of choice. Sometimes you would like to test a part of your system without having other system parts affect it. This because the other systems will add noise to the test data and make it harder to make good conclusions from the data collected. Using mocks you can remove all dependencies mocking all systems except the one system you need to pinpoint in your tests. When doing mocks for isolation these mocks can be made extremely simple but reliable, fast, and predictable. This gives you a test environment where you have removed all stochastic behavior, have repeatable patterns and can monitor specific systems well. Mockito is an open source testing framework for Java released under the MIT License. Mockito distinguishes itself from other mocking frameworks by allowing developers to verify the behavior of the system under test (SUT) without establishing expectations beforehand. One of the criticisms of mock objects is that there is a tighter coupling of the test code to the system under test. Since Mockito attempts to eliminate the expect-run-verify pattern by removing the specification of expectations, the coupling is reduced or minimized. The result of this distinguishing feature is simpler test code that should be easier to read and modify. </span>// following prints "null" because get(999) was not stubbed. Step 3: Added unit-test class. // asserts that during the test, there are no other calls to the mock object. + What's Mock framework in overview. 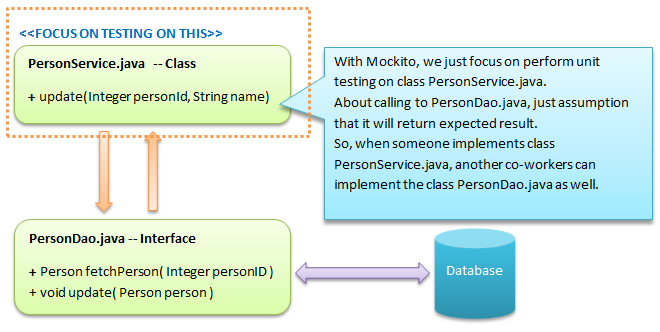 + Why we use Mockito in testing in Java development. I want to to thank you for this excellent read!! I certainly enjoyed every little bit of it. Pretty ! These was really wonderful post. Thank you for supplying this info. Very nicely explained for beginners. Step by step and "Why" do we need it in first place. Thanks. I glad you liked it. This is my first article. Hope it's useful.